Anyone who even slightly knows who superstar Salman Khan is as a person, would know that he adores kids. While he has showered a lot of love on all kids in the family, the latest tot to get all the attention from his uncle is none other than Arpita Khan Sharma’s son Ahil. The youngest kid in the Khan parivar, he is super pampered by his mamu jaan! Arpita took to Instagram to share a video of them bonding over painting. 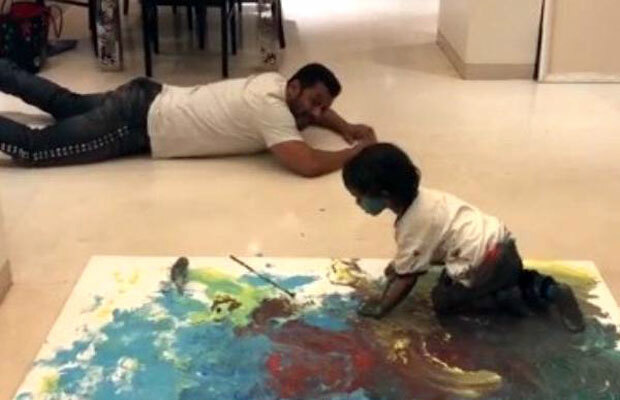 Salman does not shy away from showing his artistic side as he loves painting and now he is passing on this talent to Ahil. One can see Ahil literally drowning in paint as he gleefully colours the canvas with his whole body under the watchful eye of his uncle of course. Arpita has captioned the video has “#LoveTakesOver when moments become memories.” Check out the video below. On work front, Salman Khan is currently shooting for Bharat with Katrina Kaif. It is an adaption of Korean movie Ode To My Father and is produced by sister Alvira and Atul Agnihotri. So, it is all in the family when it comes to Bharat! He also is coming back with the controversial Bigg Boss 12 on television. He launched the event with a grand function held in Goa and prepped his fans for a sensational season of ‘Vichitra Jodis’ which happens to be the Bigg Boss theme this year. Next From Batti Gul Meter Chalu to Sui Dhaaga – Bollywood Is BACK at narrating the small-town stories!